JACKSON, Mississippi (AP) — The Mississippi House is expected to vote Wednesday on a welfare drug testing bill that Republican Gov. 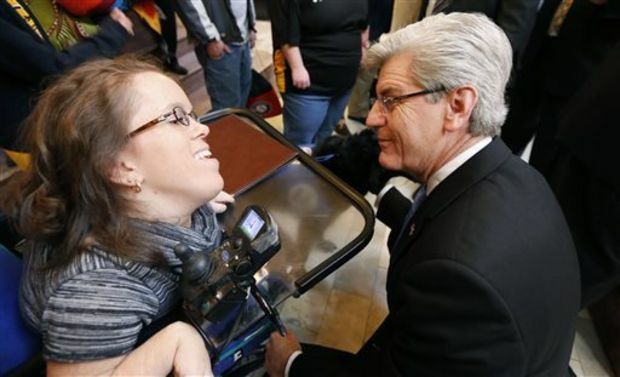 Phil Bryant is pushing, weeks after a judge struck down a similar law in Florida. Supporters say the testing would help identify people who have substance abuse problems so they could undergo counseling and treatment. Opponents, however, say it could be expensive and they’ve seen no statistics to show that welfare recipients are more likely than other groups of people to be drug abusers. “I just think this is something that’s a political tool,” Rep. Kevin Horan, D-Grenada, said in an interview Tuesday. Public Health and Human Services Committee Chairman Sam Mims is sponsoring House Bill 49, which would require any adult applying for Temporary Assistance for Needy Families to fill out a questionnaire. If the answers indicate possible use of illegal substances, the person would have to undergo a drug test. TANF is a government program that provides money to low-income families with children up to age 18. The bill passed the Public Health and Human Services Committee on a voice vote Tuesday. Mims got consent for a procedural move that clears the way for a House debate on Wednesday, and he said he intends to bring it up shortly after the House convenes at 2 p.m.
“I’m sure there will be interesting, lively debate,” Mims said. The Mississippi Department of Human Services annual report says that for the 2013 budget year, which ended June 30, the average monthly payment to a family receiving TANF was $140, while the average payment to an individual was $67. The report said that in June, 9,563 families received TANF payments. Utah started a drug-testing program for welfare recipients in 2012. A state agency found that the state spent $30,000 the first year and found 12 people who tested positive for drug use. Bryant said he believes Mississippi would run a program for a similar amount of money. During a Dec. 18 interview, Bryant was asked by The Associated Press if he had any reason to believe TANF recipients are any more likely than the general population to be drug abusers. The ruling made permanent an earlier, temporary ban the judge had issued. Florida’s Republican governor, Rick Scott, supported the drug testing, saying it protected families. Scott immediately said he would appeal the judge’s ruling.